SATA (Serial ATA) cables are used to connect modern, high-speed SATA hard drives, SSD drives, optical drives, and other drive-like devices to the motherboard. The best SATA cables available as of the time of this writing are capable of data transfer rates as fast at 6 Gbps. They are available with either straight or angled connectors. Because the price difference is trivial, I suggest that you only use SATA cables that are certified for 6 Gbps. Unlike PATA cables, SATA cables have only seven conductors and are therefore much thinner than either ribbon- or round-type IDE cables. which improves airflow and makes them easier to route inside the case. There are also eSATA cables that can be used to connect external SATA drives to a computer's eSATA port, if it is so equipped. SATA cables can be as long as one meter (about 39 inches) in length, which is more than twice the maximum length of PATA cables, and are much more rugged than IDE cables. That provides for much more flexibility in choosing where to mount hard drives, especially in full-tower or super-tower cases. SATA devices also use a special power connector. Usually the power cable and the signal cable are separate, but there are also cables that contain both connections, properly spaced to fit on the drive (and in some cases, the motherboard). 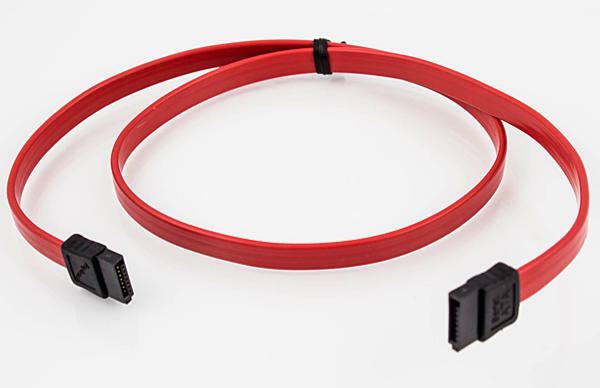 As with the signal cables, SATA power cables are available with either straight or angled connectors. They also are available with or without a latch that will hold them in place and prevent them from slipping off. I personally don't think the latch is necessary because I've never had a SATA cable slip off. But they're out there if you think you need one. 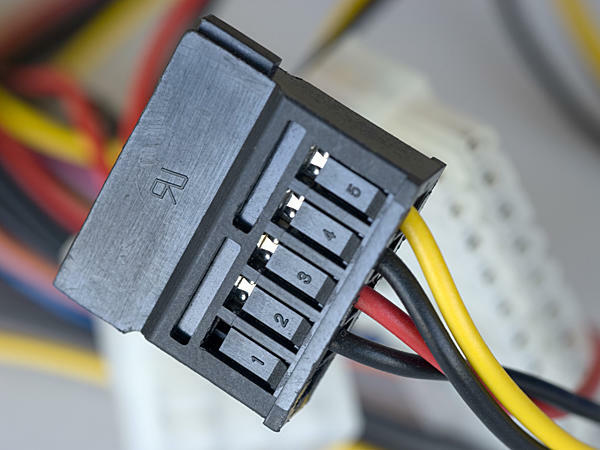 Some SATA drives introduced during the transitional period between PATA and SATA also accepted a standard Molex power connector because power supplies hadn't yet caught up with SATA drive technology. All new power supplies now include SATA connectors, however; so few (if any) new SATA drives accept Molex connectors. If you do need to connect a SATA drive to a Molex lead (for example, if you're upgrading an older computer rather than building a new one), you can purchase an inexpensive Molex-to-SATA power adapter that will do the trick. The voltages are identical for PATA and SATA drives. Only the connector is different.